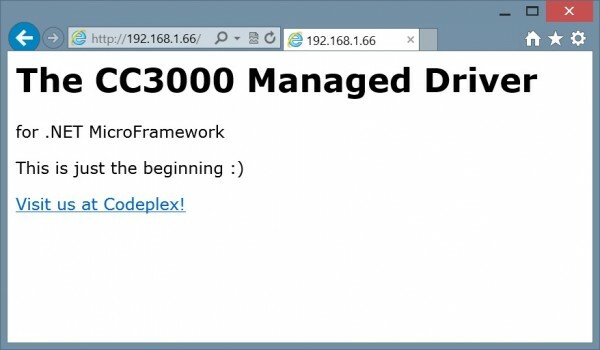 CC3000 Managed Driver for .NET Micro Framework « Adafruit Industries – Makers, hackers, artists, designers and engineers! If you want to use a CC3000 WiFi module with your Netduino (or any other microcontroller running the .NET Micro Framework), you may be interested in the CC3000 Managed Driver for .NET Micro Framework. This is a C# managed driver for the CC3000 Wifi adapter. The purpose of this driver is to empower the C# developer to debug and add advanced networking features without having to change the firmware or learn C++ (similar to that of mIP). Since this is targeted to embedded devices, this library strives to use a minimal memory footprint. Also, the classes and methods MUST be simple and obvious to use and the critical public methods will be commented properly to allow for proper intellisense. There is already a working webserver and Internet time demo, so check out the project on Codeplex.